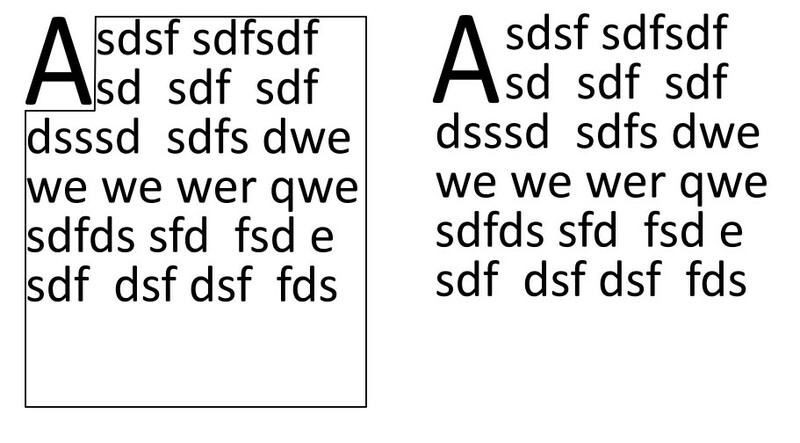 I decided to create drop cap styled paragraphs in my Inkscape project as in here, however I cannot find any tutorial on how to proceed with initials as general (link on initials Wiki). I can imagine, that there may be a hack to overlap initial with textbox (with some whitespace). Is there any cleaner and more dynamic way to achieve this task or should I try to duplicate something similar to this video in Scribus? Respectively is it possible to do it in Inkscape? Inkscape hasn't typographic concept "drop cap". It can be added only as separate element. There's even no "wrap text around inserted objects". But you can flow text into any shape which is path. You can make room for the drop cap. For ex. Draw a rectangle, convert it to path and subtract from it a piece. No fill is allowed. To flow the text into a shape you simply create a text box, type your text into it, create the needed frame shape with drawing tools, select both the text box and the frame and then go to Text > Flow into frame. In the left the path has visible stroke. In the right there's no stroke. A is a separate text object with bigger font size. I must say that this system is very inflexible. Text editing easily forces to edit also the frame and the drop cap. In the web you can easily find another receipe to make room for the drop cap. They say "shift the beginnings of the 2 top rows with horizontal kerning". Unfortunately it does not work if the text is already in a rectangular frame. Not the answer you're looking for? Browse other questions tagged inkscape typography or ask your own question. Is there a standard height in lines for a drop cap?